It’s a beautiful thing to live in a home that borders a lush, green open space. But when part of that opens space is a soggy, boggy marsh, you can bet on mosquitos in the summer. Lots of them. For my son, that’s not a good thing. You see the poor kid suffers from Skeeter Syndrome (this is what it looks like). No joke, folks, it’s for real. I don’t think Little Man had ever been bit by a mosquito until we moved to Colorado. The reaction to those first bites was pretty severe—big, red, hot, swollen. His last bite was just above his elbow and half of his upper arm swelled up! Now, whenever he heads out the door, I douse (well, generously spray) him with this homemade non-toxic mosquito repellent. So far, so good. No more bites. 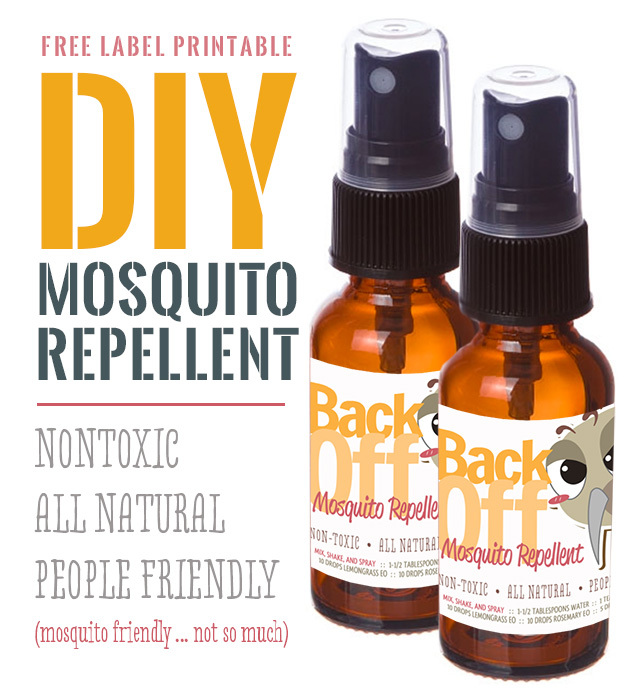 The non-toxic mosquito repellant formulation I am sharing is similar to this brand of repellent which I like and recommend to those of you who you are not up to making your own. But if you are the DIY-er type, give this recipe a try. If you make a double batch in, say, a 4-ounce bottle or larger, and you’d like to pretty up that bottle, here’s a label printable I made for you. I print it out on my color printer (may have to play with size to fit your bottle) and then affix with clear tape—ensuring the tape extends beyond the edge of the label for water/oil proof protection. Add all ingredients to a 2 ounce amber spray bottle, shake vigorously and spray. Sometimes I double the recipe and use a larger spray bottle, but lately have been mixing up three bottles at a time of the 2 ounce size and keeping them by the front door, back door, and in the car. I prefer using castor oil for its extra sticky, but not so oily, factor. Dr. Mercola has a nice write up on castor oil. Please use therapeutic grade oils. You may shop the Flo & Grace store (affiliate link) or try Mountain Rose Hebs, Native American Nutritionals or Young Living. Some folks have a strong preference for where they source their oils and I totally respect that. The point of my essential oils posts are to show you how I use essential oils and not to sell you on a particular brand. In my research these just happen to be the most reputable out there. Since you say you like to use castor oil, does that mean any carrier oil will do? I have coconut, sweet almond and olive oil on hand, and would rather not buy another oil if I can use something I already have. What castor oil do you use? Is it what you get in the pharmacy at the grocery store? You are such a crafty mamma! Hello. Is there anything I can sub the GERANIUM ESSENTIAL OIL for? I have everything else, but that and this seems a bit expensive. Lavender essential oil is another repellent oil. As for carrier oils you can use almond,macadamia or avocado oils. This is such a great idea, Lexie. I hate all the awful chemicals in commercial sprays! Is this safe to use on babies? I got oils from the kraft section at walmart, are those going to be effective? This is a good recipe. Recipes on other sites I've visited called for the usage of citrus (lemon) essential oil. Word of Caution: Exposing one's self to the sun after using Citrus EOs can cause skin irritation. It's advisable to test a product on a small skin area, then wait 24-48 hours to see if you have an adverse reaction such as itching, skin eruptions etcetera. Now I make my own blends. My friends and family started asking me to make batches for them too and thus nieceys naturals was born! 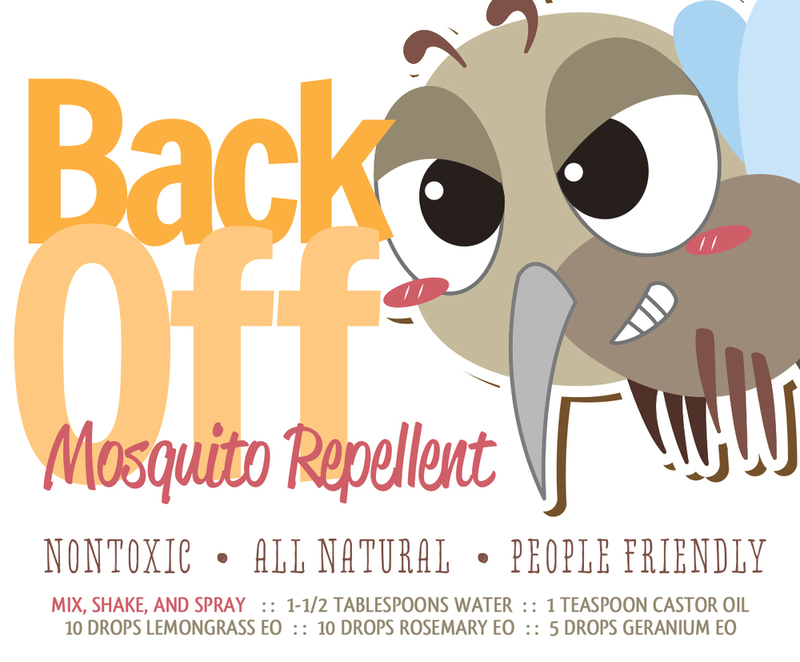 Niecey's Don't Bug me is available as a convenient pocket sized roll on and pump spray. Hope you enjoy not being bitten as much as I do! Hi – I know this is an old post, but what size/company of labels do you use for the 2 oz bottles? The ones you made are really cute – thanks for sharing! And do you use waterproof ones or just regular? Add an equal amount of Polysorbate 20 as your essential oils, premix it first in a small, separate vessel, then add it to your water and mix until well blended. No need to shake after that because the Polysorbate 20 (yes, its natural) will solubilize the essential oils into the water without needing to shake anymore. I am a chemist. Its good advice. NO need to have your essential oils separating out of the water like salad dressing. It’s important for people to know to ONLY use detoxified castor oil. In it’s natural form, castor oil is toxic. Any castor oil to be used internally, topically, or in products like soap or shampoo bars should be detoxified.